These are all easy to play with, so you can run them entirely from a USB drive to try them out. Installing them on your computer is optional. The Chrome OS software is made for Chromebooks. Chromebooks are designed to be simple, lightweight, and get updates directly from Google. Chromebooks aren’t just about Chrome OS—they’re about the total package of a computer with a simple operating system. It’s also possible that not all your computer’s hardware will work perfectly with the below operating systems, while Chromebook hardware will definitely work perfectly with Chrome OS. But you may want to get a browser-focused operating system on some old PC hardware you have running around—perhaps it used to run Windows XP and you’d rather have a more secure environment. Here are some ways you can do this. Google’s Chrome OS is built on an open-source project named Chromium OS. 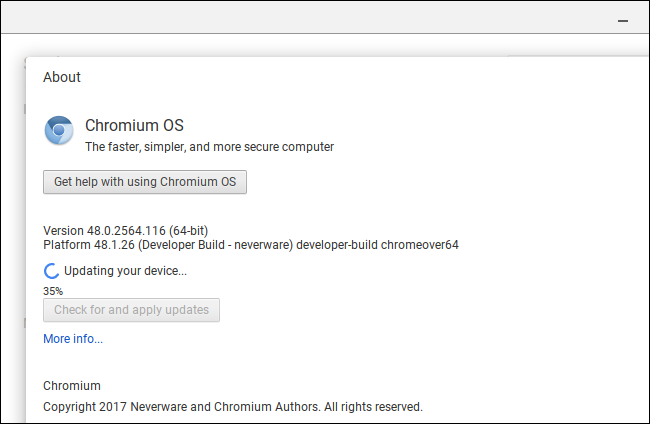 Google doesn’t offer builds of Chromium OS you can install yourself, but Neverware is a company that takes this open-source code and creates Neverware CloudReady. 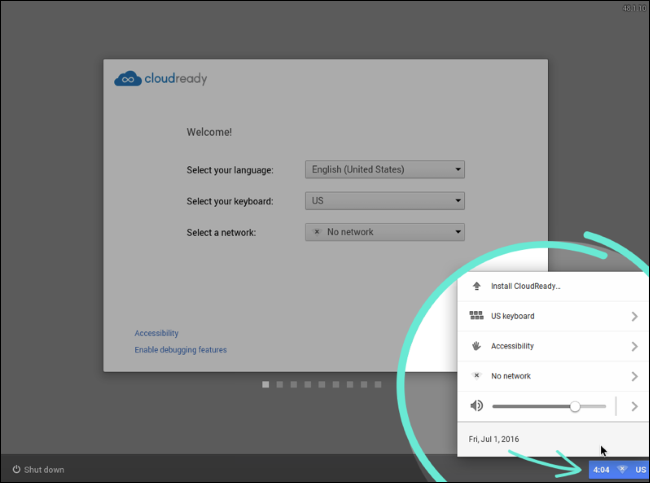 CloudReady is basically just Chromium OS with a few additional management features and mainstream hardware support, and Neverware sells it directly to schools and businesses that want to run Chrome OS on their existing PCs. Neverware also offers a free version of CloudReady for home users. It’s basically just Chromium OS modified to work on existing PCs. 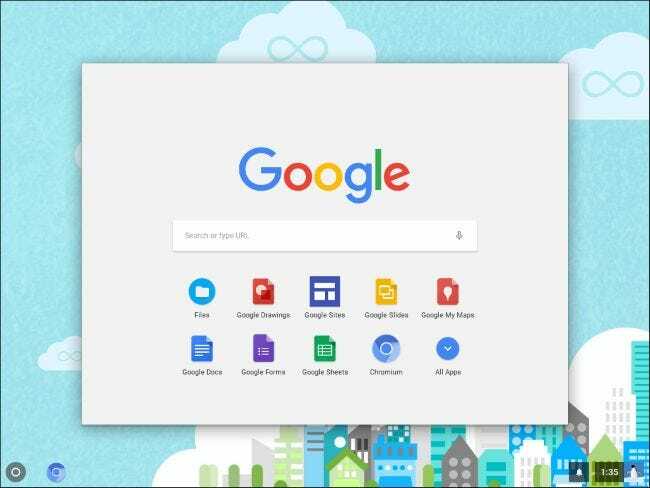 As it’s Chromium OS-based, you won’t get a few extra features Google adds to Chrome OS, like the ability to run Android apps. Certain multimedia and DRM features may also not work on some websites. While this isn’t the official version of Chrome OS produced by Google, it’s better and more well-supported than previous solutions created by enthusiasts. It even automatically updates to the newest builds of CloudReady offered by Neverware, although these tend to lag behind the latest versions of Chrome OS as Neverware has to customize them. Neverware maintains a list of officially supported devices that have been certified to run with CloudReady. It doesn’t matter if your computer doesn’t appear on this list—there’s a good chance it will work alright, too. But there’s no guarantee everything will work perfectly, as there is with a Chromebook designed for Chrome OS. You’ll probably want to try Neverware CloudReady before installing it on a computer. All you need is either an 8 GB or 16 GB USB drive and an existing computer with Google Chrome installed. Follow our guide to creating a CloudReady USB drive and booting it in a live environment. Give Neverware a try and, if you like it and it works well on your computer, you can install it on your computer by booting it up, clicking the tray at the bottom-right corner of the screen, and selecting “install CloudReady”. Consult the official Neverware CloudReady installation guide for more details. Google officially supports Chrome on Linux. Any lightweight Linux distribution can work well, providing a minimal desktop where you can run Chrome—or another browser, like Firefox. 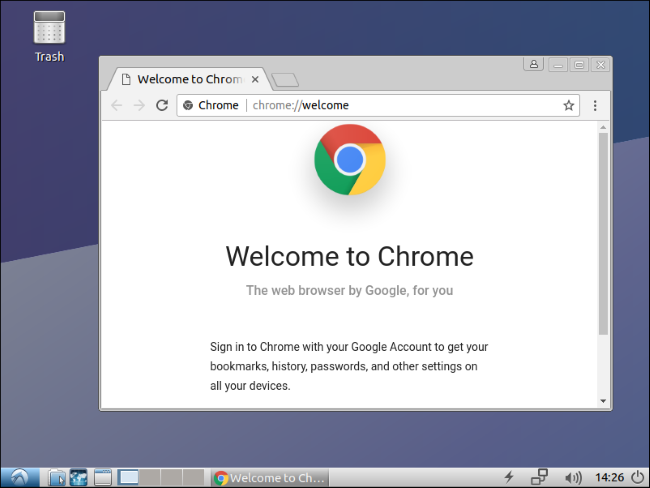 Rather than attempting to install the open source version of Chrome OS or a Linux distribution designed to look like Chrome OS, you can just install a Linux distribution with a lightweight desktop environment—or any desktop environment, really—and use Chrome on that. For example, Lubuntu is a great option if you’re looking for a lightweight Linux desktop that will run well on an older computer. However, any desktop will work. Consult our guide to the best Linux distributions for beginners to choose one that works for you. Linux distributions make a great choice if you’re just looking for a basic desktop environment to browse on. They’re also a great way to upgrade any old computers you have that may be running Windows XP or Windows Vista, giving them a modern operating system with security updates and an up-to-date browser for free. You can even watch Netflix in Chrome on Linux now. There are no dirty hacks required—it just works. Once you’ve chosen a Linux distribution, it’s as easy to try as Neverware CloudReady. Create a bootable USB drive for your Linux distribution, boot from that USB drive, and you can try the Linux environment without tampering with your computer’s software. If you decide you want to install it on your computer, you can do that right from the live environment. Note that you may need to disable Secure Boot to boot some Linux distributions on modern PCs. Of course, there’s no turning any old computer into a Chromebook. They won’t get Chrome OS updates straight from Google, and they won’t be optimized to boot as quickly. If you’re using a laptop, that laptop won’t necessarily offer the battery life a Chromebook does, either. But these are the best ways to approximate the experience, if you’re looking for something similar.